Handmade from vintage picnic jugs, coffee thermoses, old vacuum cleaner tubes and other found objects, Rocking Robot is a playful study of mid-20th century American culture and design. Combining influences from rock 'n' roll, science fiction and the sleek "futuristic" design style of the era, artist Toby Fraley turns his own childhood love of robots into a unique work of art. This overgrown nightlight provides ambient lighting and is made mostly of recycled parts that have been screwed or bolted together. Handmade in Pennsylvania. Each is one of a kind and will vary. For shipping purposes, the robot sculpture will arrive in two pieces and can be easily assembled with a screwdriver. Includes a 15-25 watt tubular light bulb. Standard lamp cord. Artist Toby Fraley has exhibited in over 40 national fine art and contemporary craft shows. Pieces are held in university, corporate and private collections, including those belonging to two different Grammy Award winning musicians. Past shows include the Smithsonian Craft show in Washington DC, the Raphael Founder's Prize Show in Pittsburgh and the One and Only Show at the John Michael Kohler Art Center. Toby also sells his works directly to galleries in over 15 states across the county. His pieces can be found in galleries such as the Philadelphia Museum of Art shop and the Society for Contemporary Crafts shop in Pittsburgh. Additionally he produces privately commissioned works and public art pieces. Currently, Toby is based in Washington, Pennsylvania about 40 minutes south of Pittsburgh. 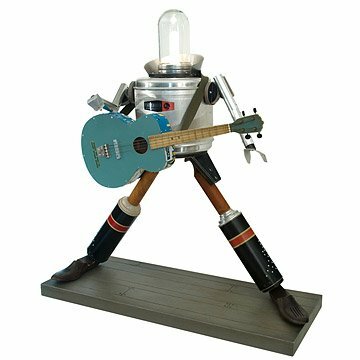 I purchased this robot for my husband who is a musician and who also loves robots. He loved it! It's such a whimsical piece and is fairly sturdy with very cool salvaged pieces utilized in innovative ways. Everyone who comes into our home comments on it and wants to turn on its light, which is also a nice touch. I wouldn't classify it as a kid's gift since it's a piece of art. The assembly was simple - I just had to attach the torso to the legs and base. It arrived much sooner than expected, too. Pay attention to the dimensions as it's true to size. Mine was slightly different than the picture in appearance but only due to the fact that each sculpture is uniquely made. Highly recommended!!! !